When you're just learning how to embroider, you want to start with a project that you can feel successful with. This list of ten free patterns will get you started as a beginner embroiderer. You'll even find some designs that are suitable for kids who are learning to stitch. 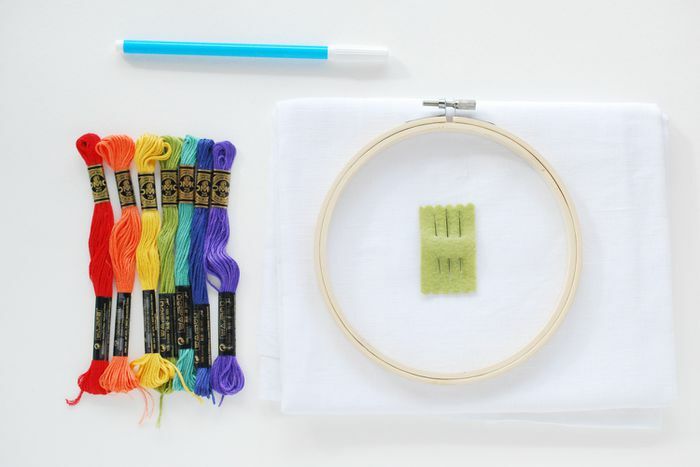 Although embroidery is an extensive craft with many forms, it's actually quite easy to get started. You don't need too many supplies, and by learning a few basics, you'll be ready to tackle any of the projects in this list. As you start out, it's good to choose a design that only requires a few basic stitches. 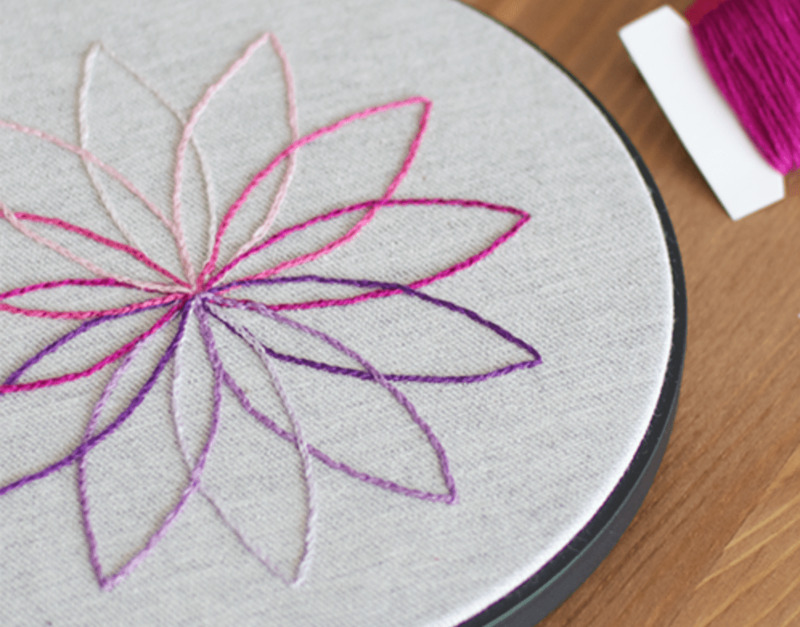 From there, expand your stitch knowledge and practice the 15 stitches every embroiderer should know, and you'll go from beginner to intermediate stitcher in no time. This simple beauty is just one shape repeated to form a modern flower embroidery. The gradation of colors adds to the charm of this design. Sara recommends working the pattern with split stitch, so you only need to learn one stitch to get started. Embroidered word art is always fun, and this one cheers you on as you stitch it! You can work the entire pattern with back stitch, using different numbers of floss strands for some variety. And when you're finished, you can display your efforts with pride and the knowledge that "You Did It! Show your love for your home state with this colorful embroidery project. Satin stitch can be daunting when you're aiming for perfection, but filling in an area with blocks of color is a good way to practice without pressure. Patterns aren't included with this free project, but you can easily find a state or country outlines with an image search, so you can start stitching. Get ready to stitch some of the cutest dachshunds you've ever seen. The Simply Sausages pattern is anything but simple. After all, they're dogs in designer sweaters. But the embroidery itself is simple enough for beginners, using only a couple of stitches. Plus, you can frame your finished embroidery like you see here or make it into an adorable baby rattle. When you want to practice your stem stitch, this beautiful butterfly is the pattern for you. Although it also incorporates a few other stitches, stem stitch is the focal point here. You'll even use stem stitch as a way to fill in solid areas. Before you start this project, be sure that you know the difference between stem stitch and outline stitch. You'll end up with a better result if you choose one and use it consistently throughout the project. A tiny pincushion is a good place to keep your threaded needles when you're not stitching, and it's also a great project for beginners. This free pattern and tutorial only use back stitch and simple machine sewing. Kids will even enjoy working on this one. Sashiko is an easy-to-learn embroidery technique because it's worked with a form of running stitch. This collection of patterns is designed to be worked with sashiko, without the overwhelming larger repeating patterns. They also work for stitching using other outlining stitches, so feel free to use them for practicing your favorite stitches. This adorable pattern was the result of Wendi Gratz and her daughter drawing kitty doodles everywhere, and once you download this free sly cat pattern, you and your kids might just start embroidering kitty doodles everywhere. It uses just one color and back stitch for an easy and cute finish. Add a bit of country charm to your kitchen with a pattern based on french rooster weathervanes. It's perfect for working in redwork, but you shouldn't feel limited to work in red, or even using only one color. And as a beginner, you'll only need to know stem stitch and french knots. 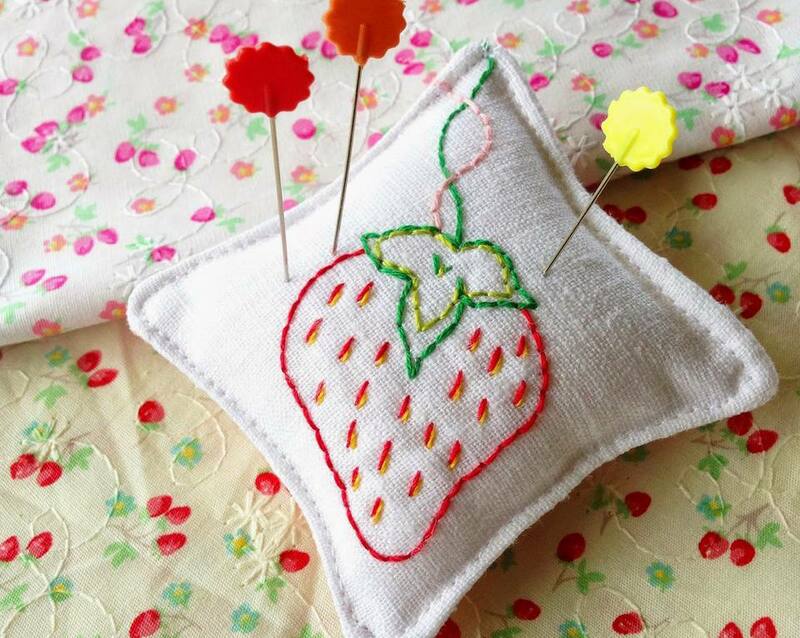 Amy Barickman of Indygo Junction offers this free pattern for a bohemian embroidered pillow. Her downloadable tutorial shows you how to stitch the motif on a tea towel, then transform it into an envelope-style pillow cover. What a beautiful way to display your newly-learned skill.